Click here if you want us to email you when there is 5DC News & Scores. 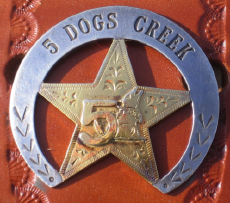 How to Subscribe: If you’d like to be added to the announcement list for the 5 Dogs Creek News just send any email (blank is ok) from your email account, to: news-join@5dogscreek.com and the happy Rowdy Wranglers Web Robot will add you right away. Bang! Ding! We never send spam! The Cowboy Way says that we treat each other right, and of course we hate spam too. (Unless it is sliced, pan-fried in a cast iron skillet, then served with cornbread, & beans and pineapple). We typically send out 2-4 messages monthly. Dependin’. NOTE: For downloads you may want to right click and “Save link to disk”. Or just click. Whatever works. If you need a current version of the Adobe Acrobat Reader, you can click here to download Adobe Reader. Enjoy!